Microbeads have recently become the target of extensive bans due to their deleterious environmental impacts, but they may soon have to compete with another tiny pollutant for attention: microfibers. A new study commissioned by the outdoor clothing company Patagonia looks at how microfibers in fleeces and other synthetic clothes are contaminating bodies of water, littering shorelines, and infiltrating food systems. It adds to the growing literature on this global problem by finding that washing the company's synthetic jackets releases an average of 1.7 grams of microfibers, or as many as 250,000 synthetic fibers and an average of over 80,000 fibers. The study found that up to 40% of these fibers end up passing through wastewater treatment facilities and into rivers, lakes, and oceans where they often end up as fish food. From here they bioaccumulate their way up the food chain, further concentrating toxins in the bodies of larger animals and ultimately ending up in the animal at the top of the food chain: humans. The plastics, which can absorb toxins such as polychlorinated biphenyls (PCBs), can end up in fish, shrimp, mussels and other bivalves that are sold for human consumption. They've even been found in sea salt and table salt. Stephanie Karba, a graduate student at the at the Bren School of Environmental Science & Management at the University of California at Santa Barbara, which conducted the study for Patagonia, told me one that one of the largest concerns in the scientific community right now is "determining what the toxicological effects of microfibers are on organisms who consume them, including humans." She said that while little is known at this time, "what we do know is that there are certain physiological impacts on the gastrointestinal tract of smaller organisms—basically the fibers, due to their shape, are caught in the gut rather than easily passed through as a spherical microbead would. The fibers can then puncture the gut lining or cause starvation from the feeling of being full." She also said that chemical coatings on synthetic clothes may be carried into the environment by the release of microfibers during the wash. Synthetic fibers from clothing, primarily polyester and acrylic, have been found to line shores across the planet, with a major 2011 study determining that microfibers accounted for 85% of human-made debris on certain shorelines, especially those near wastewater treatment plants which are often located near dense human populations. In order to determine the quantity of microfiber released by washing synthetic jackets, the UCSB researchers conducted a series of experiments using four different types of Patagonia jackets and one cheaper fleece jacket that was similar in material makeup and function. They evaluated how the type of washing machine used and the age of the garment altered the results, finding that top-load washing machines had 5.3 times the microfiber shedding when compared to front-load machines and that old jackets shed nearly double the mass of fibers when compared to new ones. In order to simulate the aging process, the jackets were put through a 24-hour “killer wash."
The authors write that the "higher shedding in aged jackets is most likely due to the weakening of fibers as a result of wear, and higher shedding from the top-load washing machine is likely influenced by the central agitator found in these appliances." Water temperatures, cycle length, and detergent type could also play a role. Detergent was not used in the tests to avoid clogging filters and the wash cycle was regular with warm water. Karba told me that the researchers were surprised by the significance the type of washing machine had on fiber shedding. She also said they "expected the hard nylon shell jacket to shed less than polyester fleece jackets, but that wasn't the case due to the inner polyester filling that we believe was released during washing." To get a sense of the macro-scale of this micro-problem, the authors calculated that a city of around 100,000 people could send anywhere from 20 to 240 pounds of microfibers into local waterbodies daily, which averages out to around 15,000 plastic bags. Put another way, washing 100,000 Patagonia jackets would release 37 to 130 pounds of microfibers into local water sources just from a single wash.
With the potential impacts these microfibers could have on the marine environment in mind, Patagonia employees like Jill Dumain, Patagonia’s director of environmental strategy, decided to commission a study even if the results would likely be scary. And they were—but they also just added to a range of issues faced by eco-conscious clothing companies. Speaking about the problems with the fashion industry last year, Dumain told CBS that "people need to learn how to buy less and companies need to learn how to be profitable in selling less…Something has to fundamentally shift in the consumption world that reduces the pressure on the raw materials, which reduces pressure on the planet and reduces the pressure on the people who make all this stuff all over the world." The issues with washing synthetic clothing adds another layer to these industry-wide problems—and good solutions are not readily apparent. The textile industry, one of the "most polluting in the world," demands raw resources that are hard to recycle and often require large amounts of energy and water. Even natural fabrics like leather, wool, down feather, and cotton have major downsides, not only when it comes to animal welfare but also chemical additives and natural resource demand. There's also all the waste from the clothing itself and any associated packaging materials. "While the cosmetic industry was able to replace microbeads with natural alternatives such as sand and nut shells that provided the same function as their plastic counterparts, the apparel industry faces a more difficult situation," state the study's authors. Karba said that switching back to natural fibers such as cotton or wool is not so simple "because those fibers do not have the identical performance attributes of polyester." "For example, polyester has wicking, insulation, non-wrinkling, and numerous other qualities to it that natural fibers do not have," she said. 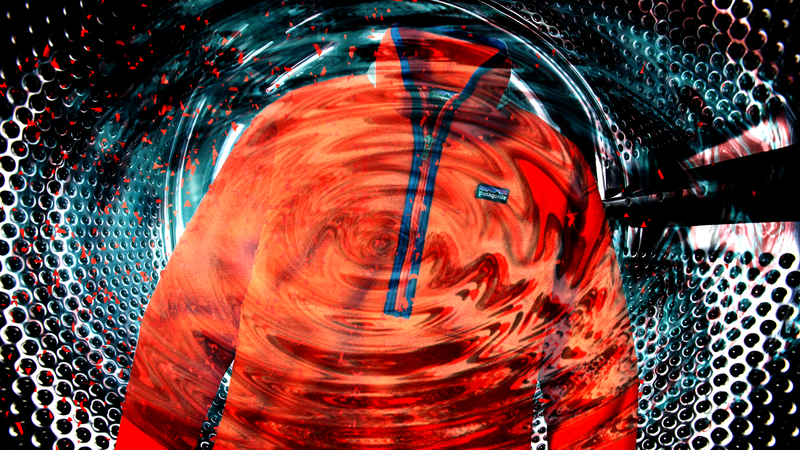 As for best washing practices, less is best when it comes to synthetic jackets such as those tested in this study. Karba also thinks it's very important that households start taking independent action and filtering out microfibers directly at the machine. "This can be done with a wash bag, where you place your jacket in a bag and contain all fibers within it," she said. "Or by purchasing a lint filter for their washing machine—a process similar to how we capture lint in our dryers."